﻿ Munroe, Kirk. Letter to Mrs. Dickinson. Cocoanut Grove, March 18, 1888. Munroe, Kirk. 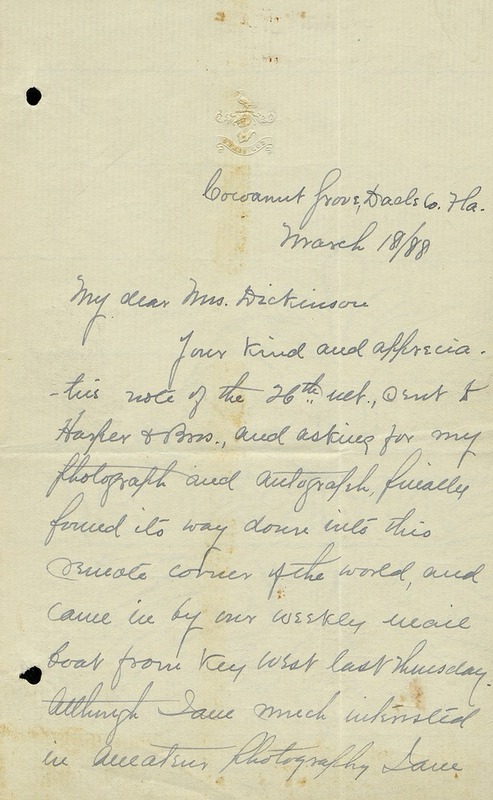 Letter to Mrs. Dickinson. Cocoanut Grove, March 18, 1888. - v .. ^1 ." .. . ', .. d.."' < ' "
. / ,- . ... .
"1 }: #- .- - * ,^ .
. / : .. ....... ..
t A t '/ s-*"t "1 9 .
'' A YiAr ,,, r 't* .> .A -,--,--,'- .
. -' -'--.-- j 9 .. . . ..- 9::< -.. ;< .? " . .... .- .- ,-.
" f .. -- ,4.
, /... ., ', . ... "^ -<~k ... .... ..- -- _. ..
kcAc" i/ "C..- .C "l .
-2< 4iC sic.- .' -.,. ," . / <. -.. / I : ,.,. E. .i c ? ..
, L .-4 ..* : ..- ,, ..# ,, . .. t., ..9 1 .4'r t- .